When I think about making potato salad, it tends to make me break out in a sweat. Because while the finished product looks easy enough, just the notion that the potato needs to be perfectly cooked enough where a fork can go through it, but not crumble….is daunting. But Matt had faith in me this week as he played a double on Monday and left a request for potato salad on my plate. And I was not about to let him down in the slightest. 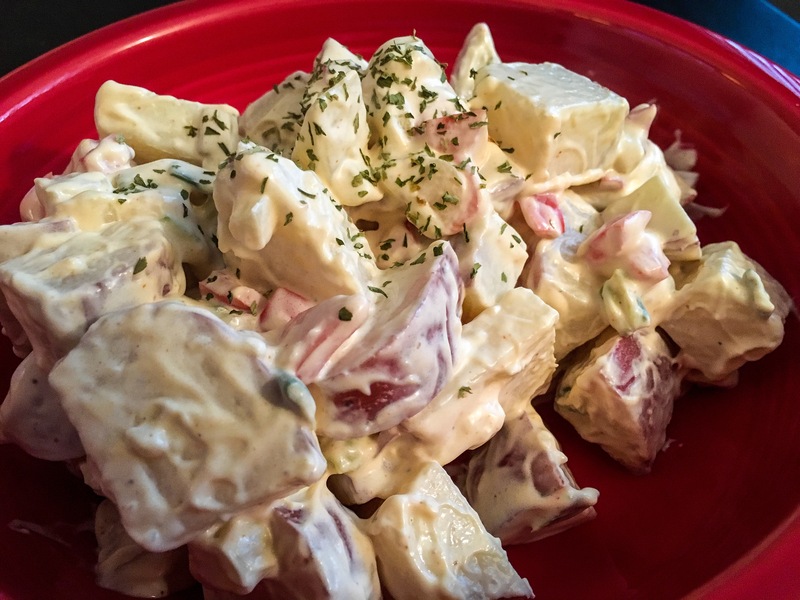 To make potato salad, red potatoes are truly the best one. They’re durable and you can pretty much leave the skin on them when you cut them into bite-sized pieces. Just make sure each potato is washed thoroughly and that any eyes or bad spots are removed. And especially since we needed to move the last of our red potatoes, it was a win-win. Place your bite-sized pieces into a pot of cold water on high heat and let it come up to a boil. To check if they’re cooked through, try to locate the largest piece and stick a fork in it. If the fork goes through with ease, then they’re done. And if you’re nervous like me, after you check the potato, turn off the heat and let the potatoes sit in the hot water for a minute or two. Trust me, they’re still cooking when you do this. Since our fridge was a little more barren of the essentials to make potato salad, I learned to get creative. This is quite typical in our home when making a multi-layered type salad. (Seriously, watch me make a garden salad or macaroni salad and you’ll understand.) I kinda think of it like a “hodge podge” dish, so to speak. Because instead of yellow onions, I used the remainder of green onions that we had from our last shopping trip. Celery was replaced by fennel stalks. And for a little pop of color, some diced red bell pepper. The only thing I think it’s missing? Hard-boiled egg. I may need to attempt this version sooner rather than later. If you’re willing to get over your fears, it’s amazing what you can accomplish in the kitchen. Matt believes I don’t give myself enough credit. And with this potato salad recipe, I’m sort of inclined to believe him. 1) Place cubed potatoes in 3-quart pan in cold water. Cover and heat to boiling. Allow potatoes to continue cooking in boiling water until larger pieces of potato are soft enough to let a fork go through. Turn off heat and allow to sit in water another 1-2 minutes before draining thoroughly and placing in large bowl. 2) Mix mayonnaise, vinegar, mustards, salt, and pepper in a large measuring cup or bowl. Whisk until smooth. 3) Add fennel, green onion, and pepper to potato mixture. Add dressing and stir thoroughly to cover. Add sprinkle of paprika and continue mixing. Cover and refrigerate for 4 hours to overnight before serving. ← Going “Swiss” on a classic….